This article provides information about 'Furnace Filter Installation'. This is a fairly easy maintenance and repair activity that you can perform yourself in just a few minutes. Of course you will need to have the correct furnace filtter on hand before you begin. There are a few considerations begore you begin. (1) 'Determining Funace Filter Size' covers getting the size right. (2) 'Types of Furnace Filters' helps you select the right one for your situation. Forced air furnaces circulate warm air through your home. Houses with central air conditioning also use the furnace to distribute cool air. When the air circulates, it picks up dust and other particulate that is not good for you. The filter catches the dust and keeps it from going back into your home. How well your furnace filter performs will depend on several factors. The first and foremost concern is the health of your family. Allergies, respiratory problems and other breathing disorders can make the concern about your furnace filter acute. Not only do you want to replace the filter regularly, you also want to replace it with the right type. You should review the articles 'Types of Furnace Filters' and 'Furnace Filter Ratings' if you have health concerns. This process works pretty well as long as the filter is changed regularly. A clogged filter will restrict the amount of air that can pass through it. This makes your furnace work harder to push the air. In addition, some of the dust and germs will get back into the system. Don't despair, filters are cheap and easy to change. What Can You Save? - Getting someone out to your home is the expensive part. Likely $50 to $75 just for the service call. Furnace filters can vary in price dramatically. From just a few dollars on up to fifty or more dollars. The cost of a furnace filter replacement goes up dramatically when you get a HEPA style filter. How Hard Could It Be? - A furnace filter replacement project is not hard at all. A few minutes and it's all done. These repairs will have a Difficulty Level of: Easy. These repairs require a Skill Level of: Total Novice. For and explanation of the terms in this section, see 'How to Use This Site'. Check the Simple Things! - Replacing a furnace filter is pretty simple already. Some types can be cleaned, thus saving the cost of a new filter. What Can Go Wrong? - Furnace filters trap dust and other pollutants in the fibers. Use caution when removing a dirty filter. You don't want to spread the dirt everywhere. Regular replacement is important. The longer a filter stays in place the more dirt it will collect. They become unhealthy when neglected. The first thing you need to know when you replace your filter is the size. 'Determining Furnace Filter Size' covered how to locate the size of your filter. The type of furnace filter you buy also matters. The article 'Selecting a Furnace Filter Type' talked about what your choices might be and where to go for more information. Removing a dirty furnace filter is probably not your first choice for things to do. The old filter can be quite dusty. If you have allergies or are bothered by dust, you will want to wear a dust mask. A dirty filter can contain dust, bacteria and viruses that have been airborne in your home. 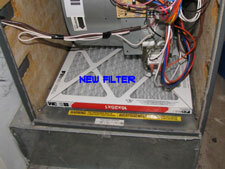 Begin you furnace filter replacement by locating your old filter. The furnace filter is located between the return air duct and the blower. This can be inside the furnace or in the duct work next to the furnace. See the article 'Determing Furnace Filter Size' for more information on locating the filter. You will have a cover plate that can be removed to get at the filter. This may be held in place by screws or some other retaining system. A filter that is located on the side will likely have a door of some sort. When the door is open the filter will slide out to remove it. Remove the cover plate to expose the old filter. It should have retaining springs or clips that hold it in place. Remove the springs and slide the old filter out. Have a plastic bag handy to keep the dust from getting airborne again. Dispose of the old filter. Use a vacuum to remove any residual dust before you install the new filter. This is fairly simple, but there are mistakes you can make with a furnace filter replacement. Most filters have wire retainers that hold the medium in place. The wire retainers should be facing the blower. Look on the side of the filter for an air flow arrow. This will indicate the correct way to turn the filter. The air will move from the cold air duct into the furnace. When the filter is inside and on the bottom of the furnace it will be coming from the bottom up. With the old filter out, put the new filter in with the arrow turned the proper way. The arrow should be pointed toward the blower. On an up flow furnace, the blower is located at the bottom of the furnace. On a downflow furnace it will be located at the top of the furnace. For a horizontal furnace, it will be on one side or the other. Unpack the filter and install it with the wire turned the right way. Put the retaining springs or clips back in place. Put the cover plate back on. That's all there is to a furnace filter replacement, pretty simple. 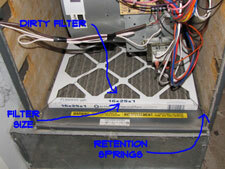 Furnace filter maintenance means changing your filters regularly. There are both cost and health issues to be concerned with. The recommended length of time between furnace filter replacements varies with who you talk to. Some will suggest as often as once a month. The longest possible duration would be annually. The quality of the filter has a bearing on this. Cheaper filters will need to be changed more often. For $5 or $6 you can get a pleated filter with a decent rating that will last for three months. This is the duration most often recommended. From a practicality and cost standpoint it seems reasonable. Waiting longer than three months is not a good idea. A dirty filter will make your furnace work harder and will affect your families health. Filters are often sold in bulk packs and you can get a years supply in one trip. Take ten minutes every three months and engage in a rewarding furnace filter replacement project. You will enjoy that deep breath you are able to take afterwards. Did you learn everything you wanted to about a furnace filter replacement project? Not much to it, but it is an important maintenance item. Keeping up with this on a regular basis will save you in furnace repairs later. The other important reward is your families health. Fewer trips to the doctor will make everyone happy. Stocking up on furnace filters even makes this an easier repair. Just remember when the weather changes, to change the filter.